The artificial leaf: A scientific Holy Grail. Scientists have been trying to replicate photosynthesis for decades. The rest of the press release can be found here: MIT professor touts first ‘practical’ artificial leaf, signs deal with Tata to show up real plants. (via Engadget). This entry was tagged Chapter 6: Photosynthesis, photosynthesis, plants. Bookmark the permalink. I think this post was my favorite, perhaps because it talks about something that is very important for the future of humanity and because it could be something that could fix a major problem, allowing more people to have green electricity and to able to pay less for it. I read in an article (the website is written in the details) that it is made of silicon with some catalyst put on it’s side and if put in water and exposed to sunlight it will stream bubbles of hydrogen and oxygen which could be used in different ways to create electricity. If humans could harness the power of the sun, wars, famine, and inequality could–in theory–be averted. While I do believe that it is impossible to create such object no matter how much one tried it would require nuclear energy because we would be trying to replicate photosynthesis which would not only require sunlight but also carbon dioxide. We would still have to find a way to make all this technology clear and the size of a poker card. Do you believe it is actually that hard to find carbon dioxide? Would it nuclear energy be required carbon dioxide? I’m a little bit more optimist. Maybe–hopefully–you will be able to see something similar in your lifetime. People have tried and tried to come up with new ways to produce energy, but we always come back to the way nature does it. Why? I think it’s because there is no machine (and will probably never exist) than can match the efficiency of nature. Scientist have noticed that to make gadgets like these work. they have to mimic nature. *Scientist have noticed that to make gadgets like these work, they have to mimic nature. I agree with the fact that we always have to refer back to narture; but I’m a little bit more optimistic with what we, as humans, can do if we pay very close attention to what nature has to say. The more we know about the leaf, the better chances we will have against climate change. If it were not for photosynthesis, we would no be alive. Time will tell. But yes, up till now, nothing is as efficient as photosynthesis. I understand your lack of optimism: I share some of it. I agree that coorporations (which nowadays are very much associated with countries) will do everything in their power to halt these type of discoveries. Some oil giants are even paying scientists to do research that denies climate change. I agree. It would require more discipline and common sense to use these technologies. The key to success, for all of mankind, is education. it’s pretty amazing what technology can accomplish now a days. If this works it would be amazing because it would help poorer country get electricity and we wouldn’t need to go dig up oil and pollute the environment. This was as recently as two years ago. Imagine what can happen in the next 20 to 25 years. Optimism should not be that hard to attain. I believe this is a great discovery, as solar panels have help several homes this leaf will also do a similar job. This could also help the environment and the cost of the electricity. Renewable, cheap energy sources would help many generations to come. This is a great advancement it really is. This kind of discovery may help humany fix the mess they have made. This may help make more plants and even genetically alter the artificial plant to take it to another planet and make it possible for humans to live there. If politicians had a fraction of the enthusiasm that this guy has about energy and sustainable technologies, we would be in a very different place today–possibly wars for oil would be absurd, instead of a “necessary evil”; just as the powerful countries want us to believe. Great video, Andrea. Thanks for sharing. The possibilities are limitless. An utopia of energy. 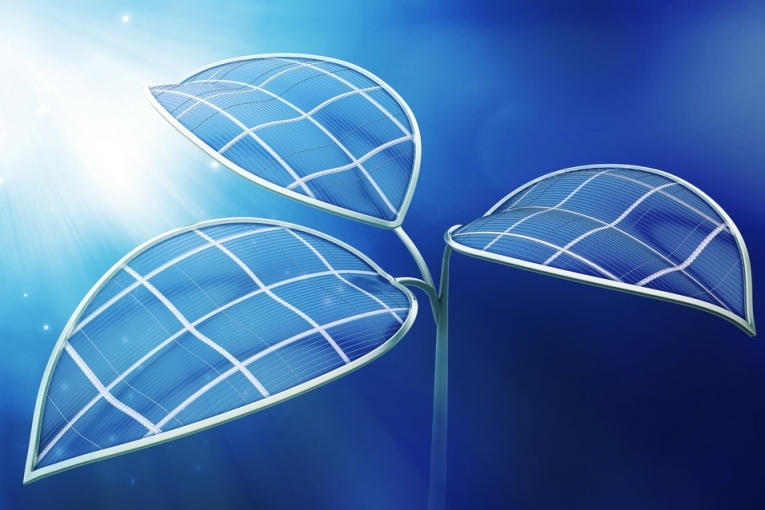 It would be amazing that an artificial plant could give electricity to homes. I think it’s a great step towards better technology and a better future. 🙂 http://www.scientificamerican.com/article.cfm?id=artificial-trees-harvest-sun-and-wind-energy this site shows a similar technology. you should see it! If you’re interested in alternative ways for sustainable energy, check out what scientists are doing with a substance called ‘graphene.’ I encourage you to do a brief Google search of the words «graphene» and «photons». These technologies hold the key for the survival of the human species in the next century or so. Lets hope that progress in alternative sources of energy does not get bogged down by inept politicians. I never thought a machine could ever replace our nature… for me, this descovery is an open door for a new future. If they make it, If they fully understand the biochemical pathway, things could change completely. we could have an alternative to survive. Let’s hope, for the sake of humanity, that the artificial leaf becomes an actual, practical alternative to oil. I haven’t seen The Lorax, but now I will. Now that you’ve mentioned synthetic and living things in one sentence, google the concept «singularity». And this is just the beginning. Imagine what we will be talking about in the next decade. With this technology, a lot of people with economical problems will have a relief, this can bring down the electricity payments. Indeed. Not just cheaper energy for people that already used electricity, but cheap energy for people that have never seen an actual light bulb. The is close to a billion people around the world that do not have electricity. This is really cool if it can be made. If it is made it would be an advance in science. Many more advances are made almost on a daily basis. Artificial leaves promise a lot. It states how scientists are trying to create an artificial plant that converts CO2 to O2. My only concern is that it seems that we are becoming too dependent on technology to solve issues that nature naturally solves. This technology might greatly benefit us but at some point it might replace trees in urban settings. For me, it would be a shame to see nature disappear from our daily lives. Your concern is a valid one. And I share it as well. There is another artificial leaf you showed us in class recently. Its one made out of silk and chloroplast. I had said that taking the chloroplast from natural leaves to use in an artificial leaf seemed counterproductive, but in reality this artificial leaf could have far more applications. Julian Melchiorri talks about lining the sides of buildings with them, which he states would offer more oxygenated air for residents. He even talks about them being used for oxygen in long-distance space travel. But for now the leaf doesn’t survive long enough. However, the artificial leaf in this blog post seems almost ready to power a whole house for a day.